I never knew this Midwestern chef was actually a beach boy, so it only made sense for him to open his first restaurant blocks from his home in Manhattan Beach. Be sure and make reservations before you arrive. During the weekends he regrettably turns away sometimes up to 100 guests. It’s packed. The bar area does have communal tables open for walk-ins, but they fill up quickly. Plus, if you reserve a table, a cute hostess, keeping with the postal theme, will lead you to your table and hand you an envelope with your name on it. Inside is the MB Post menu folded like a letter. Since the location was once the original Manhattan Beach Post Office, LeFevre kept the theme throughout MB Post. My daughter and I sat against the old textured brick wall with the words Local, Air and Parcel stenciled on the surface with arrows pointing down. The dark brown exposed beams and harvest pumpkin colored walls add to the rustic décor. I really enjoyed the wood paneled walls with painted street signs. “The wood is from the trestle that supported a railroad in Salt Lake City,” explained LeFevre as he strolled by our table welcoming new guests and shaking hands with his regulars. He sat with us for a few minutes to talk about his new chapter in life. “I’m kinda getting used to this morning thing,” he announced while wiping his brow. 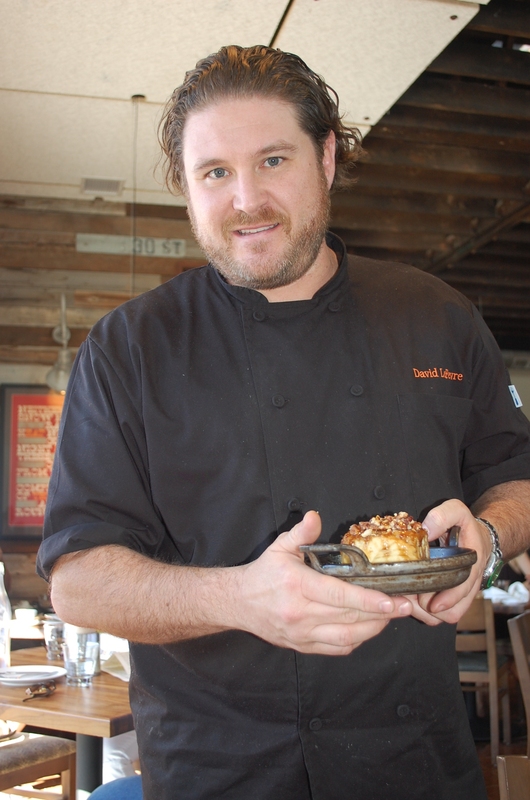 LeFevre recently designed a brunch menu and is now open on the weekends from 10 a.m. to 1:30 p.m. That means Friday night he locks up around 12:30 p.m. and is back at 6 a.m. on Sat. to start baking bread and preparing for brunch. Yikes! I can’t feel too sorry for LeFevre, he is young, extremely talented, lives at the beach and adored by all who step into his social house. Folks enjoy seeing him cruising the Santa Monica, El Segundo and South Bay farmers markets buying up fresh produce for his daily specials. The brunch menu at MB Post encourages guests to eat family style and share with each other, however the food is so good, that I didn’t feel like sharing too much. My daughter could have a bite of some things, but most of the dishes I wanted just for myself. The best way to order for two people is to select two entrees, a sumthin’ sumthin’ and a few breads. Sumthin’s are Nusske’s bacon, turkey sausage bacon, Weiser farm fingerling potatoes or a fresh fruit dish. 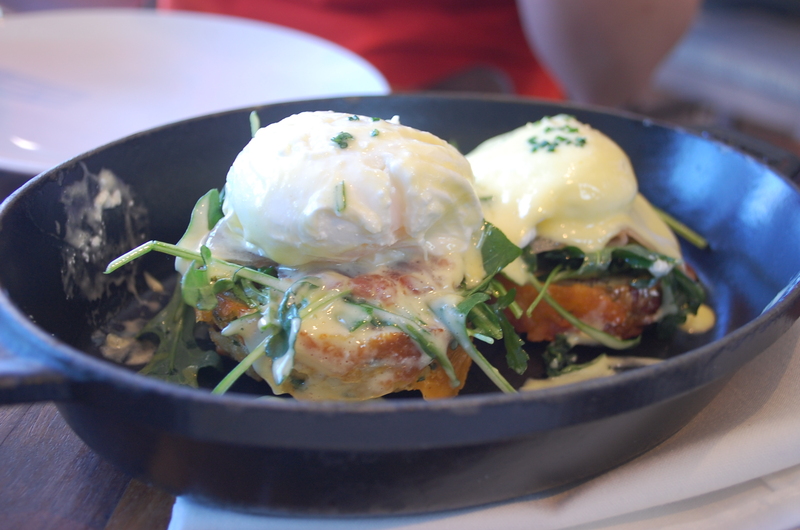 His amped up Eggs Benedict is unique with arugula (instead of spinach) and La Quercia procuitto (instead of Canadian bacon) that rests on a savory bacon cheddar homemade biscuit and adorned with a mellow hollandaise sauce. I initially resisted ordering this dish served in a black cast iron skillet, because I had my eye on the healthier frittata with sprouting broccoli, white cheddar and piperade (a French dish with onions, green peppers and tomatoes). Our sweet server, Angela, insisted I order the Benedict. It’s her favorite brunch item. Thank goodness I did. The menu is filled with delicious carbs, so I had to limit my order of breads to only two items. 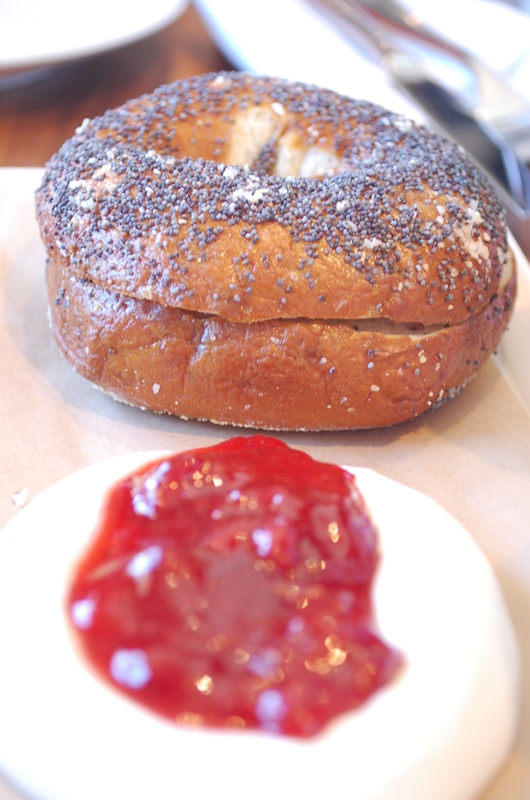 The belly button poppy seed bagel with super soft almost melted cream cheese and fresh strawberry preserves was my favorite. 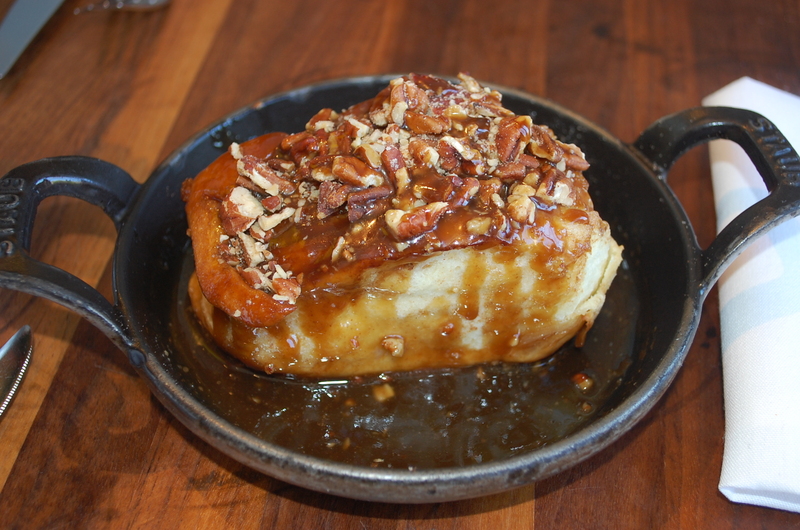 LeFevre’s super sweet sticky buns with pecans and melted brown sugar are scrumptious. LeFevre offers some interesting cocktails created by the General Manager, Jerry Garbus. The Pirate Ship Revenge has quince, maple and ginger mixed into Gosling’s black seal. Another is the Last Rites Sangria with pear, quince and hibiscus. The Coughlin’s Law would cure anything with its Belgian pilsner, tomato juice, dill, picante and quail egg served in a glass jam jar. Wines by the glass come in 3 oz. and 6 oz. There are a few draught beers and a nice selection of bottled beers. When our check arrived, it was inserted into a book titled: Chefs: Met and Liked. Inside are little messages from past guests. I eagerly opened the book to write a note about Chef LaFevre. It was hard to find an empty spot in the book. Pages were filled with accolades about the dishes and the chef. 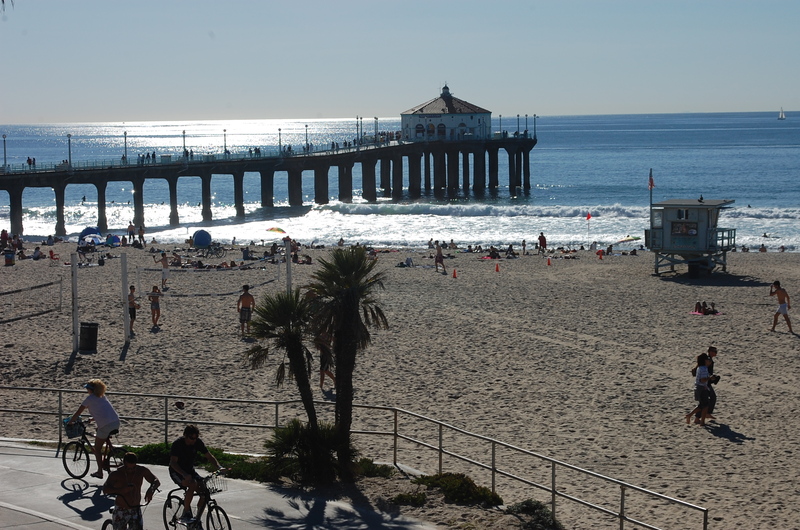 With a fully and satisfied belly, I walked off the calories I consumed by taking 150 steps to the Strand and then out to the Manhattan Beach Pier to the Roundhouse marine studies lab and aquarium. I was more at peace too. $$ Hours for dinner are Sun. through Thurs. 5 p.m. to 10 p.m., Fri. and Sat. 5 p.m. to 11 p.m. Brunch is Sat. and Sun. 10 a.m. to 1:30 p.m. 1142 Manhattan Ave. (310)545-5405. Courtesy of the Beverly Press.